This quinoa pilaf with cherries and pine nuts is an easy, seasonal, no fuss side dish. It’s naturally vegan and gluten-free, ready in less than 30 minutes, and super customizable. Tossing some cherries into a savory side dish is sort of becoming a thing in my kitchen. Gonna have to go with sorry, not sorry on that one. As much as I love cherries on their own and in sweets, the season is short and I need to stuff as much of them into my gullet as possible while they’re around. I mean, isn’t that written into the food blogger oath or something? 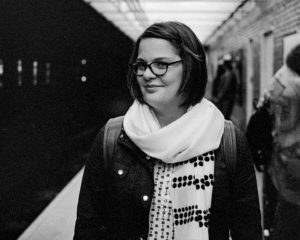 “That shalt shove as much seasonal produce into thine pie hole in the most efficient and delicious manner possible.” If it’s not, it should be. So what’s up next? This quinoa pilaf with cherries and pine nuts. Ten years ago when the quinoa rage was emerging and I was experimenting with a vegetarian diet I pretty much lived off quinoa salads. I’d make a gigantic batch every week and toss whatever odds and ends I had lying around the fridge and pantry into a bowl, smother it with some kind of herby vinaigrette and call it lunch, dinner, and sometimes even breakfast. Cameron quickly tired of my quinoa obsession and asked that I tone it down a bit. After a fair bit of grousing and foot stomping I eventually acquiesced. While we still eat plenty of the stuff, I try to keep the menu offerings a little lower key. 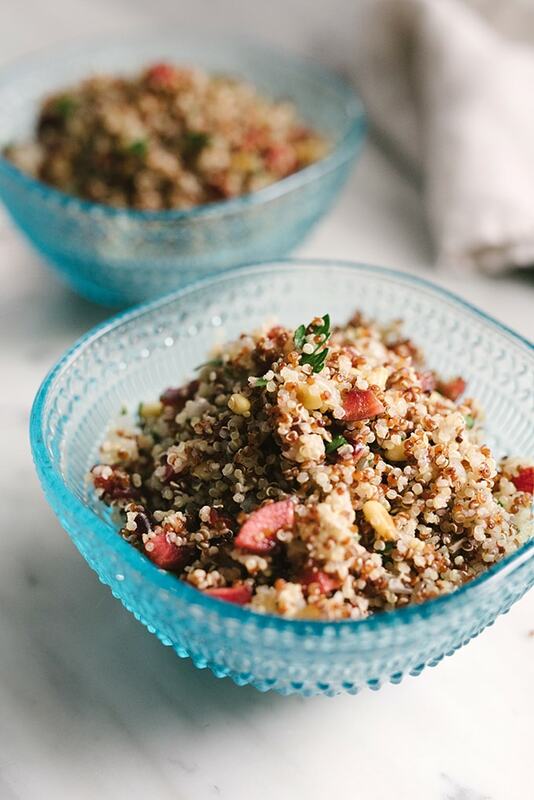 Serving quinoa as a side dish, like with this quinoa pilaf, gives me the best of both worlds. I can force him to eat it along with some sort of carnivorous offering, and still have plenty leftover to enjoy a big salad the next day (and sometimes the day after that too). This, my friends, is called “marital compromise” or as I like to call it “letting your husband think he wins sometimes”. Pin it now! 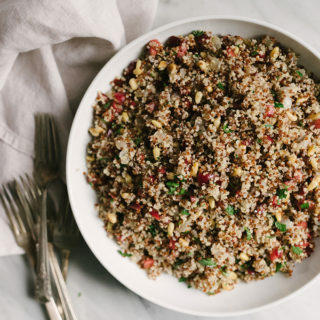 Click here to add this Quinoa Pilaf Recipe to Pinterest! 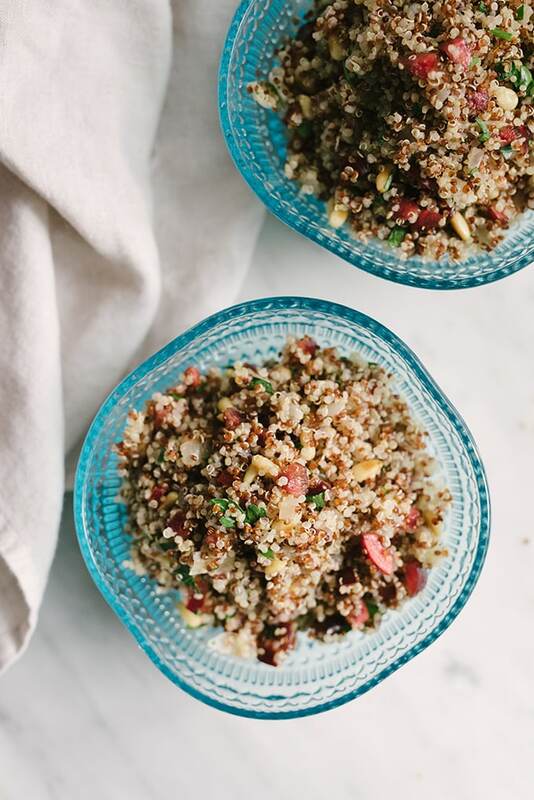 Quinoa pilaf is so easy and so customizable that I should be embarrassed to call this recipe. Let’s call it a suggestion instead, shall we? You’ll start off by sautéing an onion in a little olive or avocado oil. Add the quinoa and get it a little toasted, then add your water or broth, cover, and simmer until the quinoa is cooked through. Fluff the quinoa and onions with a fork. Quinoa pilaf base = done! Now it’s time for the mix-ins. I like to go with something crunchy, something sweet, something herby, a little citrus zest, and hit of acid – either the citrus juice itself, or a little vinegar. The resulting balance is sweet and savory, with a variety of punchy flavors and fun textures. In the case of this quinoa pilaf with cherries and pine nuts I went with pine nuts for crunch, fresh cherries for sweet, parsley, and lemon juice and zest. And ZOMG, it’s lip-smacking delicious. You’re welcome. Once you have the onion and quinoa base established, you can go in a hundred different directions with your mix-ins. The only thing I recommend consistently keeping is the lemon (or lime…or orange) zest. It’s a subtlety sharp, slightly acidic flavor that is loaded with citrus aroma. It just adds that little extra something that elevates the dish from tasty to exceptional. If you’re in the mood to customize, here are some seasonal ideas in addition to this cherry, pine nut, parsley combination. Just remember to chop the vegetables pretty close to a mince to keep it in the pilaf texture range. PIN IT NOW, MAKE IT LATER! 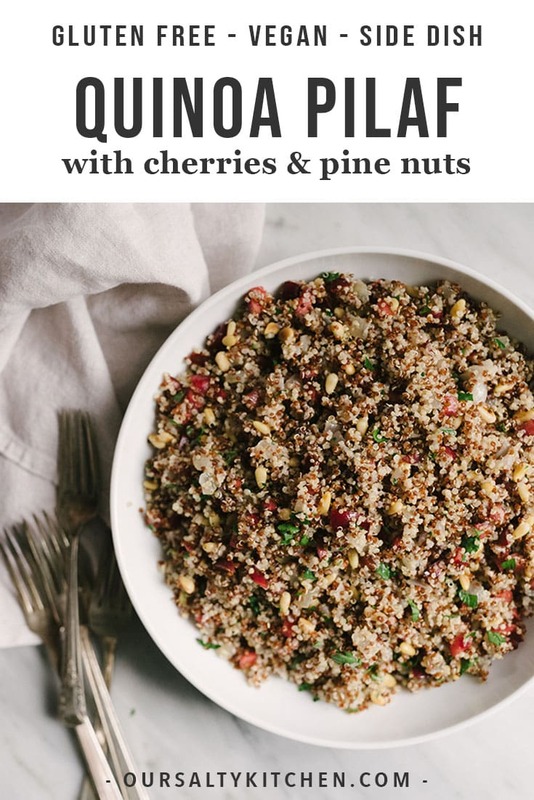 CLICK HERE TO PIN THIS QUINOA PILAF WITH CHERRIES AND PINE NUTS TO PINTEREST. 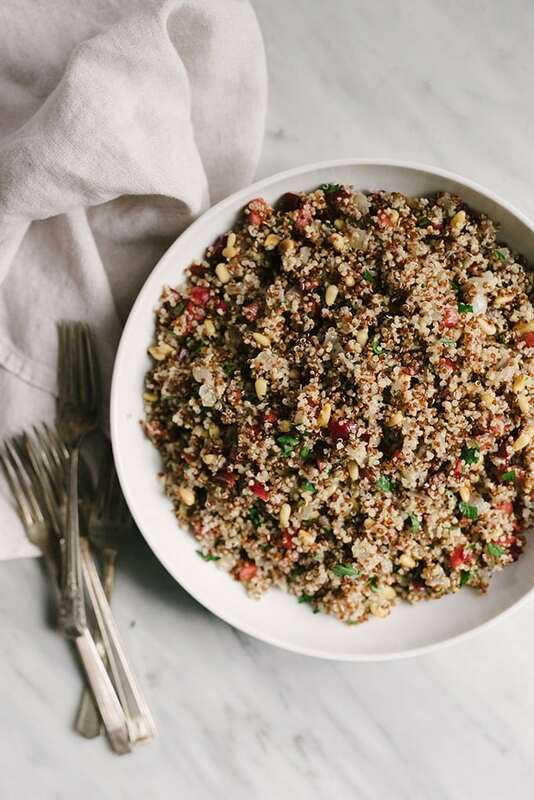 This cherry quinoa pilaf with pine nuts is an easy, seasonal, no fuss side dish. It's ready in less than 30 minutes and super customizable. Heat a medium sauce pot over medium high heat. Add the oil and heat until it shimmers. Add the onion and sauté until translucent and just starting to brown around the edges, 5-7 minutes. Add the quinoa to the onions, stir to coat in the fat and gently saute for 1-2 minutes. Add 2 cups of water to the sauce pan, stir the onions and quinoa, then partially cover so steam can escape and cook the for the length suggested on the quinoa packaging (mine was 10-12 minutes). While the quinoa is cooking, prepare the remaining ingredients. Heat a small skillet over medium high heat and add the pine nuts. Toast the pine nuts in the pan, shaking continuously, until the nuts are golden brown and fragrant, 3-5 minutes. Pit and chop the cherries, and mince the parsley. Once the quinoa and onions are finished cooking, scrape them into a large bowl and allow to cool for 5-10 minutes, or up to overnight in the fridge. 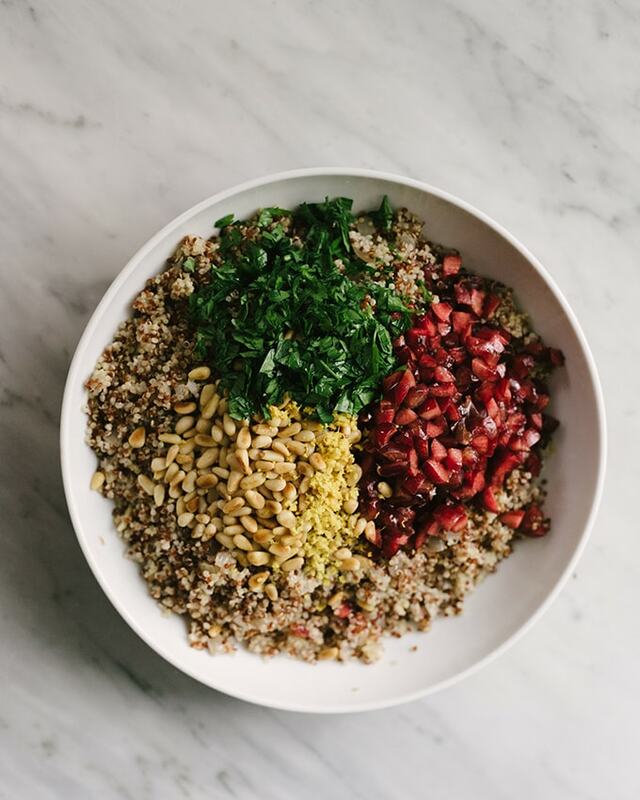 To serve, add the cherries, pine nuts, parsley, lemon zest, lemon juice, salt and pepper to the quinoa onion based. Toss and serve immediately. Keeps in the fridge for up to 1 week.